1With the arrival of William Force Stead in 1927, Worcester College, Oxford, secured its place among the footnotes of modern literary history.1 College Chaplain from 1927 to 1930 and Chaplain and Fellow from 1930 to 1933, Stead was a friend of both Yeats and T. S. Eliot, and it was partly to thank Stead for baptising him as an Anglican in the summer of 1927 and arranging for his private confirmation by the Bishop of Oxford the following day that Eliot gave a rare, only partially documented and hitherto undated reading of The Waste Land at Worcester College.2 This present article, centred on ‘Oxford Poets’, an unpublished talk that Stead gave at some point (probably in the early or mid-1960s) after he took up a Professorship of English at Trinity College, Washington, D.C., seeks not only to provide details of Eliot’s Worcester reading, but, more significantly, to augment and in some small ways correct George Mills Harper’s 1980 account of ‘William Force Stead’s Friendship with Yeats and Eliot’3 by bringing to light Stead’s own recollections of Yeats. 6 Robert Sencourt, T. S. Eliot: A Memoir, ed. Donald Adamson (London: Garnstone Press, 1971), 105. 3On leaving the University of Virginia in 1907 (not 1908), Stead was accepted into the American Consular Service, his first post being US Vice-Consul in Nottingham. He was US Vice-Consul in Liverpool by the time he married, in 1911, Anne Francis Goldsborough, ‘a Washington girl of the best style and society’.6 Their first child, Philip Hugh Force Stead, was born in Chester in 1913, but not long afterwards Stead’s life took a marked change of direction when he decided to train for the Anglican priesthood. He attended Ripon Clergy College in 1915 and Ridley Hall, Cambridge, in 1916, his first assignment as a clergyman being curate to the Vicar of Ross-on-Wye (1916-19).7 It was here that he became friends with a Radley schoolboy, Henry Vere Fitzroy Somerset, a scion of the local gentry, who would go on to be elected to a Fellowship in History at Worcester College, Oxford, in 1921. 8 ‘William Force Stead’, Enoch Pratt Free Library. 9 Minutes, Governing Body, Worcester College Archives, WOR/GOV 3/2. 10 Minutes, Governing Body, Worcester College Archives, WOR/GOV 3/2. 14 Stead to Cobden-Sanderson, 17 April 1934, University of Delaware. You will not envy me my coming ordeal at Worcester College. The Provost is sore as hell with me; you know they created a new and special Fellowship for me in 1930, and then I not only resigned but joined the Church of Rome! Of all horrible things, especially in the cold fish like eyes of The Rev. F.J. Lys, Provost of Worcester and Vice Chancellor of Oxford. He is one of the old time drab and dreary Protestants who regard the Church of Rome as a purely Satanic Power. He would not have minded much if I had become a Buddhist or a Mohamedan ... But to become an R.C., is, in his eyes, to become a Devil Worshipper. 15 Stead to Cobden-Sanderson, 28 March 1933, University of Delaware. 20 MS 23, Series III, Subseries 1, Enoch Pratt Free Library, Baltimore. 23 Peter Force Stead adopted the religious name Julian when he became a Bene­dictine monk. 24 Stead to Cobden-Sanderson, 10 December 1939, University of Delaware; Harper, 25, 37-38. 27 The Jolly Farmers, Paradise Street, is still a pub and now far from shabby. The Sitwells were much in evidence, tho’ they lived in London…Edith already looked like a Sienese Madonna in purple brocade and hung about with pearls; Osbert and Sacheverell looked like what they had recently been, young guardsmen, officers in a smart regiment…More diverse in effect were the ‘Jolly Farmers.’ None of us were farmers; we were a group meeting on Saturday evenings to read old plays, – Elizabethan and Jacobean – in an ancient public house called the Jolly Farmers. Comforted by a blazing fire on the hearth, a bowl of punch in front of the fire, and long clay pipes, we sat on the only furnishings in the room, hard wooden settles against the walls. We chose it as providing the right background, a shabby old ale-house unchanged since the days of our Elizabethan authors. But it had remained unaltered only because it was in one of the poorest and slummiest parts of Oxford.27 And this gave rise to an astute suspicion; why were Oxford undergraduates lurking in such dark and thievish corners of the city? …The youngest of our group was the fabulous and flamboyant Roy Campbell. I didn’t know what to make of him in those days…He was sort of half in and half out of the university; that is, he had been allowed to take up residence on condition that he passed his entrance examination at the end of the year. 30 Anon., ‘A Bed of Verses’, Nation, 27.22 (28 August 1920), 673-74. I have heard that you are kind and sympathetic toward the younger poets, and so I am venturing to send you my little volume. – As a matter of fact I am not so very young after all, having turned 30. What troubles me is ... do you think I am capable of writing poetry? This is only a small selection, but it is the best I have written. And I have always tried most honestly to be myself, and have most rigidly abstained from adopting any of the poses which have been fashionable during the last ten years. Yet very few papers have noticed my book, and the few who have, do not attach any significance to it. Especially was I hurt and crushed by this sentence in “The Nation”, – “There is no ardour nor vision in it, no reality[,] no revelation of the beautiful[,] enigmatic face of life”,30 – this hurt me especially because the reviewer had some reason to be favourably disposed toward me, since my book was introduced to him by one of my best friends who is also a close friend of his. If there is no poetry in this book, then at 30 I can hardly hope ever to write poetry – And poetry is to me everything. – What do you think? – Please forgive me if you have no time for such letters (LTWBY2, 368). 12It is noteworthy that Stead misrepresents his age in this letter: he was in fact thirty-six in September 1920, not thirty. I have been for days on the point of writing to you about your book of dis­tinguished poems. But much work put off & still puts off the reading of it in any adequate way. I wonder if you would come & see me? I shall be in but not alone tomorrow evening. If you are free come in. In any case we will have a talk later on when I have read more (CL InteLex 3783). Yeats at this time (1920) was about 55 and at the height of his powers. Under his wife’s civilizing influence, and in honour of his guests, he was wearing a dinner jacket with black tie, his hair, still without a touch of grey, was carefully brushed and slicked down. His greeting had an old-fashioned air that combined formality and dignity with something that was modest and deferential. …Yeats was vigorous, animated, confident, and controversial. I found him in the midst of a discourse on spiritualism and its evidences of survival. But every time he brought forward what seemed a convincing instance, Father Martindale found a naturalistic explanation. The learned Hindoo then offered some oriental marvels, but fared no better under the searchlight of the brilliant Jesuit. When we were leaving he lit a candle, and holding it above his head, lighted us down the stairs. At the door he asked me to wait a moment, and after the others had gone, he said he was interested in my little book, – I pricked up my ears, expecting some praise of my verses, – but he went on to explain that the spirits manifest themselves in various ways, most subtly and delicately by odours; as he took up my book, addressed in an unknown hand, he was visited by an odour of violets, – a friendly and favorable odour: would I care to come in the following Monday evening? 34 YVP3, 104. See also 308. Yeats, who mistook me for a philosopher and a man of learning, went voyaging off into regions with which I was wholly unfamiliar.35 He was then reading the Catholic theologian, Baron von Hugel, – and here I could offer a few comments; he was already interested in Byzantium, and I had a little knowledge of the Eastern Empire. But his range of interest – tho’ he was not a man of learning – went far beyond my boundaries. For instance, he would open a volume on Art, Apollo by Reinach,36 and ask me to compare the facial expressions in Greek and Roman sculpture, as representing the contrast between the subjective or instinctive life and the objective or rational life. This led to a discussion of the difference between the Greek and Roman civilizations, and to subjective and objective periods during the Christian era. Here I was invited to follow his involved system of intersecting cones, as the objective age or civilization was moving up into the subjective, and the subjective age or civilization was moving down into the objective. These again were symbolised by the dark of the moon as the objective, and the light or full moon as the subjective, and the transition as the gradual rounding out of the dark into the light, and vice versa. Other subjects were the Great Memory; the Pylons, or Gates of Knowledge, and the external existence of dreams: for instance, he was staying in a friend’s house, Lady Gregory’s, I believe, when he had a dream of Diana shooting an arrow at a star; he came down to breakfast and started to relate it to Arthur Symons, another guest in the house, only to find that Symons had had the same dream at the same time and had already embodied it in a poem.37 What could this mean, but that the dream was not peculiar to one dreamer? Dreams have an external existence of their own and floating through the world, they may visit several dreamers at the same time. I must have been useless as a source of information and ideas, but Yeats was lonely and felt rather neglected in Oxford; his was not the academic type of mind, and learned ladies bored him by asking, ‘Mr. Yeats, what is your subject?’ as though he were a don, with some narrow field of research. He soon adopted a blunt reply, – ‘Astrology’, and that floored them. As a matter of fact, it was one of his many interests in occultism. I have heard him inveigh against the blind and irrational manner in which astrol­ogy has been ignored by the western mind without ever being disproved. Speaking of the subject one evening, he said it was by this science that Pico della Mirandola38 had been able to foretell the year and day of his death. We were a group of 4 or 5, while Mrs. Yeats sat apart, quietly sewing by the fire, – very much ‘out of it.’ I remembered how Yeats looked over to her saying, ‘But my wife knows more about this; she has been reading Pico’s life. George, tell us something about Pico della Mirandola’, – with a gentle courtesy drawing her into our circle. Then the talk began. It was all of magic and cabbalism and the ‘Hermetic knowledge’. The great man talked while the priest and Mrs Yeats fed him with judicious questions. The matter I admit was either medieval or modern, but the manner was so xviii Century that I lost my morale. 41 The nickname of G. Herbert Ewart (1857-1924) as well as a character in Great Expectations. 45 William Force Stead, Wayfaring: Songs and Elegies (London: Richard Cobden-Sanderson, 1924), 34-36. 46 Stead to Vere Somerset, 1 September 1926, Stead’s Personal File, Worcester College. 25Similarly, in his latest collection, The House on the Wold, there are further ‘Nymph’ poems dedicated ‘To Cecilia, aged 8’, ‘To Cecilia, aged 9’, ‘To Cecilia, aged 11’, ‘To Cecilia, aged 15’ and ‘To Cecilia, aged 16’. As early as September 1926 Stead had told Somerset that he was ‘in love’ with his ‘Nymph’,46 but by 1929-1930 he had become completely besotted with Cicely Trafford and things were rapidly getting out of hand. 47 Stead to Richard Cobden-Sanderson, 7 February 1929, University of Delaware. 48 Harborne Hall, Birmingham. See n. 25 above. 50 Marriage and Morals (1929). 29In the event, it did not take long for Stead’s relationship with the Trafford family to improve, but it would never recover its old intimacy, while his marriage seemed broken beyond repair. 56 Yeats to Stead, early September 1935. CL InteLex 6331.
the greatest poet and also the most remarkable man I have ever known. Remarkable seems a trite thing to say – but I mean it literally. The man most worth noticing and observing, the man most worth speaking of and commenting on. And yet to speak of him is to do him an injustice; it makes him seem small and foolish compared with the man we know. No words can revive the flash and fire of his mind, or his capacity for filling a room with his electric personality, lifting us out of ourselves, and carrying us away into regions of cloud-capped towers and gorgeous palaces and airy tongues that syllable men’s names. Whenever I walked home after an evening with him, I heard the stars singing above me, and the memory of him remains an everlasting example of the truth that a man of genius is far greater than anything his genius creates. 61 Stead to H. V. F. Somerset, Stead’s Personal File, Worcester College Archives. 63 Letters of T. S. Eliot, 3, 306. 65 Stead, The Shadow, 9. 66 Stead, The Shadow, 23. 67 Sencourt, T. S. Eliot: A Memoir, 105. 70 See Letters of T. S. Eliot, 3, 412-13, 428-29, 543-44. 71 Alumnae Journal of Trinity College [Washington], 38.2 (Winter, 1965), 59-66. Quote from 64-65. He paused, with a suggestion of shyness. 72 Letters of T. S. Eliot, 3, 572. 73 Letters of T. S. Eliot, 3, 800-1. See also 872. 75 Anon., ‘A Visit by Mr T. S. Eliot’, Cherwell 22, n. 3 (11 February 1928), 60. Eliot was a great success and many have congratulated me on getting him down here – he was most charming and everyone seemed delighted with the gathering, which became so large that after assembling in my rooms, the Dean [C.H. Wilkinson], in his Magnificence, between rapid puffs of his pipe, suggested that we had better adjourn to his more spacious quarters – I have just heard of an amusing after effect. It appears that some culprit had been summoned to appear before the Dean that evening and give an account of his unsatisfactory behaviour. He appeared – only to find the room full of literary high brows and Eliot in the midst of reading The Waste Land in a grave and chaste manner. The reading and discussion afterwards lasted for upwards of 2 hours, while the poor culprit sat in the midst and suffered silently without the least comprehension of what it was all about. Later the Dean called him up to know why he had not reported and given an account of his misdemeanours; whereupon the ingenious youth pointed out that he had appeared on the proper day and hour. Still the Dean remained firm and fined him 5 bob and said he would have to attend three roll calls and two chapels. 77 Peter Ackroyd, T. S. Eliot (London: Hamish Hamilton, 1984), 172; Harper, 29. 78 See Letters of T. S. Eliot, 3, 913. 1 An earlier version of this essay, ‘The American Chaplain and the Modernist Poets: William Force Stead, W. B. Yeats and T. S. Eliot’, appeared in the Worcester College Record (2011), 103-33. 2 There are many letters from T. S. Eliot to Stead in the Beinecke Rare Book and Manuscript Library, Yale University, and these, alongside letters Eliot wrote to Stead that are now held in other repositories, will be published in due course as part of the multi-volume Letters of T. S. Eliot (London: Faber and Faber, 1988-). 3 George Mills Harper, ‘William Force Stead’s Friendship with Yeats and Eliot’, Massachusetts Review, 21:1 (Spring 1980), 9-38. 4 William Force Stead, ‘William Force Stead’. Autobiographical Note, stamped ‘OCT-1945’, William Force Stead Collection, MS 23, Series I, Box 1, Folder 3, Enoch Pratt Free Library, Baltimore. I would like to thank Dom Julian Stead for granting me permission to quote from the unpublished writings of his father. 5 Dom Julian has supplemented his letter of 15 June 1975 by offering me guidance and information at every stage of my research and for all of his assistance and advice I am very grateful indeed. His letters and emails to me have now been deposited in the Worcester College archives. 7 Crockford’s Clerical Directory for 1918-19, 50th Issue (London: Field and Queen, 1919), 1433. When the United States entered the War in 1917, however, Stead contributed to the American war effort by returning to the consulate in Liverpool for the remaining year of hostilities. 11 E. Roberts to Stead, 21 July 1930; Stead to E. Roberts, 22 July 1930. William Force Stead Benefaction File, Worcester College. 12 Stead to Richard Cobden-Sanderson, 18 May 1930, Special Collections, Morris Library, University of Delaware. 13 Edmund Blunden to William Force Stead, 13 August 1933, James Marshall and Marie-Louise Osborn Collection, Beinecke Rare Book and Manuscript Library, Yale University, MS 158, Box 1. There is a eulogy to Stead written after Blunden had been to dinner in Worcester on 22 February 1930 and a poem of 1 June 1930 by Blunden in celebration of Stead’s imminent election to a Fellowship, as well as other poems and letters addressed to him by Blunden, in the James Marshall and Marie-Louise Osborn Collection. The Beinecke also holds collections of letters to Stead from Richard Cobden-Sanderson and Robert Sencourt (both in OSB MSS Box 3). 16 Stead lived at The Red House, Clifton Hampden, from 1928-39, ‘the happiest period of my father’s life’ according to Dom Julian (Harper, 37). 17 Robert Sencourt, ‘A New Catholic Genius’, New Blackfriars, 14.164 (November 1933), 924-35 at 925-26. 18 Stead to Cobden-Sanderson, 30 December 1933; 10 January 1934; 17 April 1934, University of Delaware. 21 William Force Stead, ‘Christopher Smart’s Cat’, Criterion, 17.69 (July 1938), 679-85. Quote from 680. 22 William Force Stead, ‘A Christopher Smart Manuscript: Anticipations of “A Song to David”’, TLS, n. 1883 (5 March 1938), 152. 25 When Stead and Peter took their holiday in America in 1939, Anne Francis Stead returned to Harborne Hall, Birmingham, which had become a Roman Catho­lic community of Sisters of the Retreat of the Sacred Heart in 1925, and which she had first entered in the late 1920s. When it was clear that her husband and son could not return, she remained at the convent and did not leave it until 1951, when she sailed for America in the hope of being reunited with Stead. Mrs Venable (for whom see further on in the main text), however, forbade Stead from meeting his wife and Anne had no choice but to live with her sisters in Easton, Maryland, where she died in 1959. 26 Dom Julian comments in a letter to the author of 18 August 2011: ‘if anybody today is curious to know what Stead was like in real life, they should see that film .’ See also Harper, 38. 28 In his autobiography, Vivian de Sola Pinto recalls a Proctorial raid on the Jolly Farmers when Yeats was present. He is said to have responded to the Proctors’ request for his name with: ‘“William Butler Yeats, known as a poet throughout Europe and America”’. Vivian de Sola Pinto, The City that Shone: An Autobiography (1885-1922) (London: Hutchinson, 1969), 269. 29 William Force Stead, ‘Oxford Poets’, William Force Stead Collection, MS 23, Series II, Subseries 2, ‘Other Writings, 1925-1965’, Box 2, Folder 66, Enoch Pratt Free Library, Baltimore. 31 Cyril Charles Martindale (1879-1963) of Campion Hall, Oxford. I have not been able to identify the ‘Hindoo priest’. 33 CL InteLex 4096. For other references to the odour of violets in the early 1920s, see the following letters to George Yeats regarding the madness of Francis Stuart: CL InteLex 3750 (30 July 1920); 3760 (4 August 1920) and 3763 (6 August 1920). 36 Apollo, histoire générale des arts plastiques by Salomon Reinach (1858-1932) was first published in 1904. It was translated into English and many other languages. The British edition, Apollo: An Illustrated Manual of the History of Art throughout the Ages, was revised and reprinted on a number of occasions. 37 Yeats was actually staying at Tillyra Castle, the home of Edward Martyn, not at the home of Lady Gregory. For a comprehensive account of ‘The Vision of the Archer’, which occurred on the night of 14-15 August 1896, see CL2 658-63. 38 Giovanni Pico della Mirandola (1463-1494), esoteric philosopher and author of Oration on the Dignity of Man (1486), one of the foundational texts of Renaissance humanism. 39 ‘Family Letters 1905-1931’, The Collected Letters of C.S. Lewis, ed. Walter Hooper, 3 vols. (San Francisco: Harper, 2004), I, 524-25. 40 Dom Julian, on the other hand, notes that Anne Stead was very friendly with Richard Cobden-Sanderson and his wife and with Vere Somerset. 42 Collected Letters of C.S. Lewis, ed. Hooper, I, 525-34; quotes from 529-32. Despite his contempt for what went on there, Lewis returned to Yeats’s house with Stead on 21 March 1921: see 533-34. 54 This reference is quoted by Harper (25), who reads it, perhaps a little too briskly, as ‘purely perfunctory, suggesting haste or illness’. 55 The Oxford Book of Modern Verse 1892-1935, ed. W. B. Yeats (New York: Oxford University Press, 1936), 233-35. 59 The Letters of T. S. Eliot, Vol. 3 (1926-1927), ed. Valerie Eliot and John Haffenden (London: Faber and Faber, 2012), 306, n. 2. 60 When Stead gave a talk on ‘The New Poetry’ to The Philistines Society at Worcester College, Oxford, on 31 October 1927, he confessed that he ‘found something wrong with’ such verse and more particularly that it was ‘a breakaway from ... the tradition of all time – it throws off rhythm and all suitable choice of subject matter.’ He went on to read out a series of ‘examples in ascending ... order of merit, starting with the ultramodernists through [Carl] Sandberg, Edith Sitwell to Blunden.’ (Proceedings of The Philistines Society, Worcester College, Vol. 1, 736; Worcester College Archives, WOR/JCR 3/4/1/1). The report of the discussion following Stead’s paper (738) makes it clear that The Waste Land was one of his examples of ‘ultramodernis[m]’. 62 ‘I know my poems will never be popular’, Stead had told Yeats on 10 June 1924, ‘– not with the masses because they are not what the “people” read, – nor with the critics, because I am a Tory and a High Churchman and modern views of the arts and of the way to express them are anathema to me’ (LTWBY2 455). 64 William Force Stead, The Shadow of Mount Carmel: A Pilgrmage (London: Richard Cobden-Sanderson, 1926), 6-7. 68 Stead had baptised Cobden-Sanderson in his church at Littlemore in December 1926 before he was privately confirmed by the Bishop of Oxford at Cuddesdon the following day. See Stead to R. Cobden-Sanderson, 24 December 1926, and other letters from Stead to Cobden-Sanderson written that month and earlier that autumn now housed at the University of Delaware. 69 Letters of T. S. Eliot, 3, 404. See this same page for Stead’s reply and his likely allusion to Cobden-Sanderson’s recent baptism and confirmation. 74 ‘Some Personal Impressions of T. S. Eliot’, 62-63. See also Harper, 30-31 for an account of Eliot’s annotated copy of this essay. 79 Review of Theodor Haecker, Virgil: Father of the West, Criterion, 15, n. 57 (July 1935), 680-81, quote from 680. 80 I would like to thank the following people who kindly assisted me with the research for this article: James Campbell; Anita Carrico of the Enoch Pratt Free Library; Diane Ducharme of the Beinecke, Yale; Emma Goodrum; John Kelly; Jaime Margalot of the Morris Library, University of Delware; Jo Parker; Dom Julian Stead; Michael Whitworth, and Edward Wilson. BRADSHAW, David. ‘Oxford Poets’: Yeats, T. S. Eliot and William Force Stead In: Yeats's Mask: Yeats Annual No. 19 [online]. Cambridge: Open Book Publishers, 2013 (generated 24 avril 2019). Available on the Internet: <http://books.openedition.org/obp/1416>. ISBN: 9782821854086. Bradshaw, David. “‘Oxford Poets’: Yeats, T. S. Eliot and William Force Stead”. Mills Harper, Margaret, and Warwick Gould. Yeats's Mask: Yeats Annual No. 19. Cambridge: Open Book Publishers, 2013. (pp. 77-102) Web. <http://books.openedition.org/obp/1416>. MILLS HARPER, Margaret (ed.) ; GOULD, Warwick (ed.). 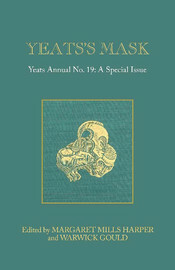 Yeats's Mask: Yeats Annual No. 19. New edition [online]. Cambridge: Open Book Publishers, 2013 (generated 24 avril 2019). Available on the Internet: <http://books.openedition.org/obp/1397>. ISBN: 9782821854086. Mills Harper, Margaret, and Warwick Gould, ed. Yeats's Mask: Yeats Annual No. 19. Cambridge: Open Book Publishers, 2013. Web. <http://books.openedition.org/obp/1397>.